A well known Chinese Mönch who visited India und traversed a large number of countries covering more than 50,000 Li. Though the dangers that he encountered were viele he fulfilled sein main objective undaunted by them. His contribution to the cause of Buddhism in general und to the Great Vehicle in particular is immense. For these und viele other reasons he is held by the Chinese Buddhists in the highest esteem among the pilgrims of sein calibre. The following information on Hsūan-tsang's travels und sein accounts of India und other countries which he travelled in sein long journey is based mainly on two sources, namely, "Si-yu-ki, Buddhist Records of the Western World" an English translation of the Chinese version of Hsūan-tsang und "The Life of Hiuen-tsiang" an English translation of sein biography written in Chinese by Shaman Hwui-li, a disciple of his. Among secondary sources the most useful treatise is 'On Yuan Chwang's Travels in India', a critical study written by Thomas Watters in 1961. This work is based on Hsūan-tsang's Hsi-Yu-Shi (or Si-Yu-Ki) auch entitled Buddhist Records of the Western World. Hsūan-tsang was born in 603 A.C. in Chin-lu in der Regierungszeit von Emperor Wen of the Sui dynasty und lebte about sixty-fünf Jahre. Opinions, however, differ bezüglich the exact Jahre of sein Geburt und death. His secular name was Ch'en-Chin und he was the youngest of vier Bruders. His Vater was Ch'en-hui who devoted himself to the study of Confucious' teachings. Even as a Kind Hsūan-tsang was unusually of grave temperament und intelligence. He did not enjoy the company of boys of sein age nor did he appreciate their life style. His second Bruder, Chang-tse who had entered the Order previously took Hsūan-tsang to sein own convent und made arrangements to impart instruction to ihm there. Hsūan-tsang (= Ht.) was so studious that at times he studied without sleep und even food. At one hearing he is said to have comprehended a book thoroughly und after a second reading needed no further instruction. At the age of eleven he was versed in the Saddharmapundarika Sutra und the Vimalakirtinirdesa. At the age of thirteen he was admitted into the Order und was engaged in further studies. The political situation in the country being unsatisfactory the two Bruders went to Chang'an und from there again to Ch'eng-tu, the capital of Shu. There Hsūan-tsang followed lectures on the scriptures delivered by eminent scholars und in a few Jahre he mastered the scriptures of various schools und earned a name as a scholar. It was about this time oder a few Jahre later that he came to be known by the appellation "The Master of the Law". In the fifth year of Wu-te he received full ordination at Ch'eng-tu. He went to Chin-chow for further studies where he auch conducted sermons as an advanced student. Scholar Mönche who gathered there as listeners treated ihm mit great respect und admiration. Thereupon he went to Chaochow, Hsiang-chow und Ch'ang-an und studied the Samyuktābhidharma-hrdaya, the Mahāyāna-sangraha, the Abhidharma-kosa etc. In a short time Ht. mastered all the theories of the different schools of Buddhism und was acclaimed as a great scholar. He found that Buddhist teachings he had learned, mainly those concerned mit the theory of Dharmalaksana und the views held by the propounders of the Mahāyāna-Sangraha und those held by the followers of the Dasabhūmivyākarana were at variance. Moreover, he discerned viele defects in the Chinese translations of the sacred books, und consequently he cherished the idea of going to India to learn at the feet of orthodox scholars. In this he was inspired to some extent by sein forerunners Fa-hsien und Chi-yen who undertook similar tasks. 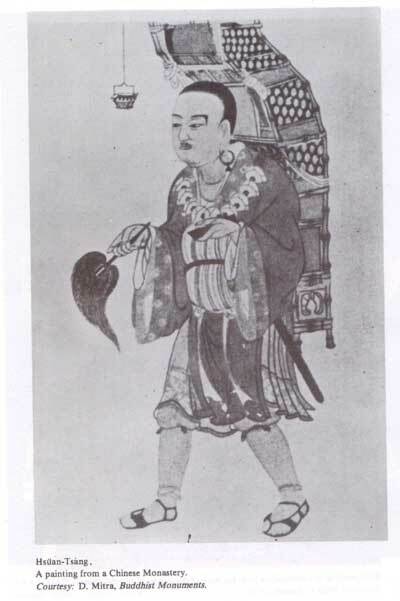 Overcoming viele obstacles Ht., at the age of zwanzig-six Jahre set forth from Chang-an und going through several provinces oder countries came to Liang-chow where he received a companion to travel to the West. Despite the attempts of spies to detain ihm the governor of the province, Li-chiang, however, let ihm proceed on sein journey. Some of the territories oder countries which he traversed until he reached the borders of North India were Turfan (Kau-chang), Agni (O-ki-ni), Kuche (Kiuchi) an oasis in the Gobi desert, Nujkend (Nu-chin-kien), Chaf (Che-shi), Ferghanah (Fei-han in Turkestan), Sutrishna (Su-tu-Ii-sse-na), Samarkhand (Sa-mo-kien), Kesh (Ki-shwang-na), Kunduz (Hwo), Bhaktra oder Bactria (Fo-ho-lo), Bamiyam (Fan-yen-na) und Kapisa (Kia-pi-she). His journey was beset mit dangers und hardships. As the nur guide given ihm to accompany until the last of the watch towers in sandy desert auch deserted him he went on all alone. The worst experience encountered was in the heart of the Mo-kia-yen desert which extended for 800 li. One hundert li after entering the desert he lost sein way. By accident sein water bag gab way without leaving a drop of water in it und he had to spend vier nights und fünf Tage in the desert without water. At a later stage when wending their way up the snow-clad Ling mountain, und the snowy mountain (Hindukush) lying to the south of Balkh, twelve oder vierzehn of sein companions und an even greater number of oxen und horses met mit death. Obstacles caused by robbers on sein way to India und auch in India itself were more than embarrassing. Even governors oder kings of certain countries embarrassed him as he was proceeding towards India. Although very hospitable und respectful to Ht. der König of Kam-chang, Khio-wen-tai planned to detain ihm in sein court as his spiritual head. Ht. got out of this grip nur by the threat of fasting unto death. Another attempt to detain ihm was made by the Great Khan of the Turks. As will appear below, Ht. underwent another such experience in Eastern India as well. Of the countries which were traversed by Ht. on sein way to North India, Bhaktra (Po-ho-lo), Bamiyan (Fanyen-na) und Kapisa (Kia-pi-she) were active centres of Buddhism. According to Ht, there were about drei tausend Mönche of the Little Vehicle in Bhaktra. There was a scholar Mönch called Prajñākara who was versed in the drei pitakas of the Little Vehicle. Ht. was pleased mit sein explanation of the doctrine of that school. Ht. reached Bamiyan crossing Hindu-kush. In both Bamiyan und Kapisa, there were several tausend Mönche of the Little Vehicle. In Bamiyan there were drei imposing figures of der Buddha. One of these was a standing figure of about 140 or 150 feet high. Another figure of the standing Buddha measures 100 feet in height. Ein enormous figure of the recumbent Buddha depicting sein 'Nirvana' measures 1000 feet in length. At a conference held in a temple of the Great Vehicle in Kapisa Ht. being thorough mit the teachings of both schools, proved sein superiority over all who participated in it. From Kapisa onwards sein itinerary covered territories in North India of which the following place names are graphed by Ht. into a separate unit. Lamghan (Lanpo), Nagarahara (Na-kie-to-ho), Gandhara (Kien-to-lo), Udyana (U-chang), Takshasila (Ta-ch'a-shi-lo), Urasa (Wu-la-sa), Kashmir (Kia-shi-mi-lo), Punach (Pun-nuh-t'so) und Rajapuri (Ho-lo-she-pu-lo). According to Ht, common people in the above territories differ to some extent from those of India in respect of manners, clothing und language. Si-yu-ki, Buddhist Records of the Western World (Records) ed. Samuel Beal, New Delhi, 1981, Bk. II, pp. 68, 917; The Life of Hiuen Tsiang (=The Life) ed. Samuel Beal, New Delhi, 1973, pp. 57-72. The countries from Lamgham to Rajapuri both inclusive were not regarded by the people of India proper as forming parts of their territory (Watters, Thomas, On Yuang Chwang's Travels in India, pub. Munshi Ram Manohar Lal, Oriental Publishers und Booksellers, Delhi, 1961, p. 180, (Abbreviated as Watters). Nagarahara (Jelalabad) occupies a prominent place as a country possessing Buddha's relics. In Nagarahara oder its neighbourhood Ht. rejoined sein companions und went to Gandhara by the Khyber Pass. He gives the names of a number of sages und saints who composed sāstras there. Then he goes to describe the famous stupa of 400 feet in hacht ascribed to König Kanishka. It was situated in Purushapura (Po-lu-shu-po-lo), the capital of Gandhara. Either side of the river Subhavastu (Su-po-fa-sa-tu) in the country of Udyana is said by Ht. to have been thickly populated by Buddhists in former days. At the time of sein visit he saw the country depopulated. The few Mönche who were there at the time belonged to fünf different schools viz. the Dharmaguptas, the Mahisāsakas, the Kasyapiyas, the Sarvāstivadins und the Mahāsanghikas. Among the objects of worship are erwähnt figures of Avalokitesvara und Maitreya bodhisattva. In Takshasila, Urasa und Kashmir, too, he saw various Buddhist sites. The chief Mönch in Kashmir was of high moral character und of remarkable intelligence. This Mönch explained viele parts of the doctrine to him. This learned teacher was so impressed by Ht. that the latter was compared to Asanga bodhisattva in respect of sein wisdom. According to Ht. Kanishka, convened an assembly, known to history as the Fourth Council, in the vier hundredth year from the 'Nirvana' of the Tathāgata. Ht. stayed for two Jahre studying sutras und sāstras. Leaving Kashmir Ht. made sein way to Punach und from there to Rajapuri. From Rajapuri he entered a different zone in North India arriving at Takka (Teheka) as its starting point. To the east of the town called Narasimha (Na-lo-sang-ho) he und the accompanying sāmaneras encountered a band of fifty robbers who robbed them of their belongings. However, a Brahmane in the neighbourhood came to their help und they managed to escape mit no loss of life. There he remained for one month, und for vierzehn Monate in das Königreich von Chinapati (Chi-na-po-tai) studying various texts. Before reaching the next important Königreich, Mathura (Mo-t'u-lo) he passed through das Königreichs of Jalandhara (She-lan-t'o-lo), Kuluta (Kiu-la-ta), Satadra (Shete-to-lu) und Paryatra (Po-li-ye-to-to). Ein interesting custom of making offerings in honour of the Schüler of der Buddha is said to have prevailed in Mathura. The followers of Abhidhamma made offerings in honour of Sāriputta, those who praktizierten meditation....... in honour of Maudgalyāyana, the students of the sutras...... in honour of Purnamaitrāyaniputra, the followers of the Vinaya..... in honour of Upāli, the bhikkhunis..... in honour of Ananda, the Srāmaneras.... in honour of Rāhula und followers of the Great Vehicle.... in honour of bodhisattvas (Watters, pp. 302, 303; The Life, p. 77). After Mathura besuchte er Matipuram (Ma-ti-pu-lo) which was ruled by a König of the Sūdra caste. He makes reference to Gunaprabha der Autor of Tattvavibhanga Sāstra und to a learned doctor called Sanghabbadra who was versed in the Vibhāsā of the Sarvistivāda school und who composed the Kosa-kārikā. Ht. stayed there for a few Monate und studied various texts unter the eminent Mönch called Mitrasena. On sein way to Kapitha (Kis-pi-tha) auch called Sankassa he had to go past Brahmapura (P'o-lo-hih-mo-pu-lo), Ahikshetra ('O-hi-shi-to-lo) und Virāsana (Pi-to-shanna). Proceeding two hundert li towards north-west from Kapitha he reached Kanauj oder Kānyakubja (Kie-jo-kio-she-kwo). Its capital borders on the Ganges on the West. Watters argues that the direction shown in the text is wrong und it should be South East. He auch argues that the river in question is not the Ganges aber a tributary of that river (Waiters, p. 340; cp. auch Records, Bk. V. p. 207. It was a busy centre of Buddhism und there were zehn tausend Mönche who studied both vehicles very ardently. His account on Harsavardhana oder Harsha auch called Silāditya is of immense historical value. Countries from Ayodhyā (O-yo-t'o) to Hiranya parvata (I-lam-na-po-fa-to) constitute another phase of sein long pilgrimage. Six hundert li to the south-east from Kanauj is Ayodhya. Several tausend Mönche there studied both vehicles, und it is here that Vasubandhu und Asanga carried out their literary activities. When Ht. und sein companions were going from Ayodhya to Hayamukha ('O-ye-mu-khi) along the course of the Ganges a gang of pirates took the crew captive. As worshippers of goddess Durga the pirates were looking out for a man of good form und comely features for sacrificing to the goddess. They earmarked Ht. as the most suitable person for the purpose und were about to kill him. Suddenly a typhoon arose smiting down the trees. Clouds of sand flew on every side und the lashing waves of the river tossed the boats to und fro. The pirates getting terrified at the calamity thought that it all happened due to the spiritual power of Ht, und came down in repentance und confessed their fault. After this nasty experience Ht. went to Hayamukha und from there to Prayāga (Po-lo-ye-kia). He describes Prayāga, the confluence of two rivers, Gangā und Yamunā und the level ground of about vierzehn li in circuit, to the West. From Prayāga he set out for Kausambi (Kiau-shang-mi) where he saw viele sanghāramas, stūpas und a sandalwood image of der Buddha fashioned by König Udayana. According to Ht, there were about drei tausend Mönche belonging to the Sammitiya school of the Little Vehicle in the Kingdom of Visākha (Pi-so-kia). In Srāvasti, the next important Buddhist centre besuchte er, there were several hundert sanghārāmas belonging to the Sammitiya school. Sites connected mit various incidents are described: for instance, the spot on which Angulimāla gave up sein evil acts und was converted, the convent where Brahmacāri heretics killed a woman und accused der Buddha of her murder, the venue in which the Buddha defeated all the heretics, the place where der Buddha met sein Vater, König Suddhodana, for the first time since Enlightenment und so on. From Srāvasti he went to Kapilavastu (Kie-pi-lo-fa-sutu) where the capital as well as some tausend villages were in a state of ruin. There he saw old foundations of the main palace of Suddhodana und the sleeping quarters of Queen Māyā etc. Hsūan-tsang's account of Kapilavastu und Kusinagara (Kushi-na-kie-lo) or Kusinārā is replete mit accounts of the life of der Buddha before und after his Enlightenment, for example the place of sein Geburt, prophetic pronouncement, sites of the Four Signs, Parinirvāna etc. According to Ht. the contemporary tradition has it that der Buddha's Nirvina' took place on the fifteenth day of the latter half of the month of Vaisākha. The Sarvāstivādins held that it took place during the second half of the month of Kārtika i.e. November. Referring to das Königreich von Banaras oder Bārānasi (Po-lo-ni-sse) he speaks of two schools of Mönche, one belonging to the Sarvāstivāda und the other to the Sammitiya school both belonging to the Little Vehicle. Important sites such as the venue of der Buddha's first sermon und sein washing tank are erwähnt in sein account. From Bārānasi he went to Ghazipur (Chen-chu) und then to Vaisāli. There the capital city was in a state of devastation und ruin. The inhabitants at the time of sein visit were very few in number. In a sanghārāma there der Buddha is said to have recited the Vimalakirti Sutra. Three important places relating to sein Parinirvana are auch erwähnt. On sein way to Magadha (Mo-kie-to) he stopped at the town of Svetapura where he obtained the sūtra called the Bodhisattva-pitaka. He had a high esteem for the people of Magadha. According to ihm there were about zehn tausend Mönche mostly belonging to the Great Vehicle in Magadha. The capital of Magadha was desolate und in ruins. According to Ht. Asoka held a convocation of a tausend Mönche at a monastery called Kukkutārāma. This is an allusion to the Third Council held unter the patronage of König Asoka. The monastery in question is named as Asokārāma in the Dipavamsa und the Mahāvamsa, the two ancient Pali chronicles of Sri Lanka. Referring to Nairañjāna und other important sites at Bodhgayā he mentions various beliefs bezüglich the Vajrāsana. One such belief holds that the site of the Vajrāsana was the centre of the universe. He says that the Bo-tree had been continually cut down und destroyed by the members of the royalty. An anderer Stelle he refers to one König named Sasānka of Karnasuvarna in Eastern India who destroyed the Bo-tree (Records Bk. viii, p. 121). The following account of Ht. bezüglich the Bo-tree seems interesting in respect of rituals which developed in later times. "The Bo-tree sheds its leaves when the day of the Nirvana approaches und tender leaves begin to grow after this day. Every year on that day kings, ministers und magistrates pour milk on its roots, light lamps, scatter Blumen und they go away collecting leaves. The account on the Nālandā monastery gives some idea about its academic activities, maintenance, academic staff und student population, curriculum und residential quarters. It says that after the "Nirvana" of der Buddha an old König of that country called Sakrāditya built this convent out of sein great attachment for der Buddha. By the time of Ht. 's visit it had been about 700 Jahre since its establishment. Thus its founding dates back to 1st century B.C. His purpose of going to Nālandā was to learn the principles of the Yoga-sastra, The chief Mönch Silabhadra admitted Ht. as sein disciple. Among the students there were viele foreigners. According to Ht. of all the sanghārāmas of India Nālandā Monastery was the most remarkable for its grandeur und height. Resident students numbered zehn tausend. They studied the teachings of all the eighteen schools und auch subjects such as the Vedas, the Hetuvidyā, Sabdavidyā, the Cikitsāvidyā, the works on magic (Atharvaveda) und the Sānkhya system. There were 1541 scholars who were versed in various branches of study. Within the temple hundert pupils were being arranged every day for preaching und students attended these und participated in discussions without fail. As for the source of income of the Nālandā monastery Ht. tells us that there was a farm-house belonging to the monastery. The account does not say anything about the way in which the farm was run und how the income accrued to the monastery. There were other sources of income too. According to Ht. der König of the country remitted the revenue of about hundert villages for the endowment of the convent. Two hundert house holders in these villages contributed rice, butter und milk daily. Hence students had no complaints to make about their requisites. In Rājagrha he locates viele important sites connected mit various episodes; for instance, the site of the stupa where Devadatta in conjunction mit Ajātasatru rājā let loose the drunken elephant mit intent to kill der Buddha. Referring to the Grdhrakūta (Ki-li-to-lo-kiu) it is said that while residing there der Buddha declared the Saddharmapundarika (Fa-hwa), the Mahāprajñā (Tapan-jo) und numerous other Sutras. His account on the First Council held in Rājagrha is rather misleading. It appears that he has incorporated into it certain details which deal mit later councils. According to Ht. the collection of scriptures authorised by the Council came to be called Sthavira collection because Kāsyapa (Mahā Kassapa) officiated as the president of the assembly. As regards the emergence of the Mahāsanghika school Ht. informs us that Mönche who were excluded from the Council held by Mahā Kāsyapa assembled in Rājagrha und made a collection of the doctrine in fünf Pitakas, the Sutra Pitaka, the Vinaya Pitaka, the Abhidhamma Pitaka, the Miscellaneous Pitaka und the Dhārani Pitaka. How this assembly got the name Mahāsanghika is explained as follows: "As in this assembly there were ordinary persons (Fan-fu) und holy men it was called the Convocation of the Mahāsanghikas (The Life, p. 117 cp. Dipavamsa, H. Oldenberg, New Delhi, 1982, 5,30). Having visited sacred places in the vicinity of Nālandā Ht. returned to the Nālandā Monastery again und studied several texts such as the Yoga-sastra, the Nyāyānusārasastra, the Hin-hiang-tui-fa-ming, the Hetuvidyā-sastra, the Prānyamūla-sastra-tīkā und the Sata-sastra. Although he had studied the Kosa-vibhāsā und the Satpadābhidharma-sastra in different parts of Kashmir yet he studied them again at Nālandā Monastery. He auch studied Brahman literary works und a grammatical treatise der Autor of which is not known. On the task of studying the Buddhist und Brahman texts he spent fünf Jahre. The next country besuchte er was Hiranyaparvata (I-lanna-po-fa-to) where he stayed for one year und read the Vibhāsā und the Nyāyānusāra-sastra etc. From Hiranyaparvata he made sein way to das Königreich von Champa where Mönche followed the Little Vehicle. This country was infested mit wild beasts such as the elephant, wolf, rhinoceros und black leopard. Elephants in that country were used for drawing carriages. Countries zwischen Champa (Chen-po) und Samatata (San-to-ch'a) form another phase of sein long journey. besuchte er Hiranya, Kajughira (Ki-shu-ko-kie-lo), Pundravardhana (Pu-na-fa-tan-na) Karnasuvarna (Kielo-na-su-fala-na) before arriving at Samatata. Monks in Pundravardhana belonged to both vehicles whereas those in Karnasuvarna belong to the Little Vehicle of the Sammitiya school. Monks in Karnasurvarna did not use either butter oder milk in keeping mit the traditional teachings of Devadatta. Immediately after sein account on Samatata he refers to Pegu und Siam which, however, lay outside sein itinerary. Countries included in sein itinerary in the East und South-east of India were Tāmralipti (Tan-mo-li-ti), Orissa, Kalinga (Kie-ling-kia), Southern Kosala (Kiao-sa-lo), Andhra (An-to-lo), Dhanakataka (To-na-kie-tse-kia) und Chulya. All these countries had centres of Buddhism. He refers to an entrepot called Caritra (Chi-li-ta-lo) situated on the South-eastern frontier of Orissa. Dhanakataka, according to Ht. war einmal a reputed centre of learning, und learned men used to come und dwell there aber at the time of sein visit it was entirely desolate. The Kingdom of Chulya may be identifiziert mit the Cola Kingdom. He locates the Chulya Kingdom outside the Dravida country. What made ihm follow this description is not clear. The Cola Kingdom formed part of the Dravida country through the ages. The next place besuchte er was the Kingdom of Dravida. The territory occupied by Dravida people could have consisted of several Königreichs oder countries, aber Ht. refers to it as forming one Königreich. However, the capital of that Königreich is named Kanchipura, the Geburt place of Dharmapāla Bodhisattva. Whilst in Kanchipura Ht. met some drei hundert Mönche from Sinhala. They informed ihm of the unsettled situation prevailing in Sri Lanka at the time. This dissuaded ihm from going there. His purpose of going to Sinhala was to get the Tripitaka explained according to the Sthavira school there und auch to study the Yoga Sāstra. Malakūta was the next important place besuchte er. He refers to Malayagiri which was well-known for sandalwood und the karpūra scented tree. After Malakūta (Mole-kiu-ch'a) he refers to Sinhala again. According to Ht. Sinhala was originally called Po-chu as it had viele gems of a rare character. As for the origin of the Sinhala he narrates mit slight variations the legend which traced the origin to a lion König und the murder of the lion by sein son. According to Ht. it was the Sohn von the lion who arrived in Po-chu und not sein grandson Vijaya as recorded in Sri Lankan chronicles. A second theory about the origin of the Sinhala is narrated as follows: "But it is auch said that Sinhala is the name of a Kaufmann's son, who...... came to Po-chu island und slew the Rakshasas und established sein capital in the country. With regard to the teachings prevailing in Sri Lanka he adds that Mönche there follow the teachings of the Great Vehicle und they belong to the school of the sthaviras. He auch refers to the schism which resulted in the division of the Sangha into two factions, the Mahāviharavāsins who were opposed to the Great Vehicle und the Abhayagirivāsins who studied both vehicles. His reference to a mountain named Lankāgiri may be the Samantakūta (Adam's Peak) und it was on that mountain the Tathāgata delivered the Lankāvatāra Sutra according to Ht. Going two tausend li from Dravida he arrived at Konkanpura (Kin-na-po-lo) und from there to Maharashtra, He tells us that in a vihāra at Konkanpura there was a precious head-dress of Prince Siddhārtha. With reference to Maharashtra he says that the people of that country were a warlike nation. He cites in evidence the unsuccessful attempt of Silāditya rājā to subjugate Pulakesin. This König may be identifiziert as Pulakesin II (609-642 A.C) of the Chalukyas of Vatapi in the Bijapur District. Among the countries included in sein itinerary to the West und North-west of Narmada were Broach (Baroche), Mālava (Mo-la-po), Brāhmanapura (K'ie-ch'a), Vallabhi (Fa-la-pi), Anandapura, Surāshtra (Lasn-c'ha) Gurjjara (Kiu-che-lo), Ujjayin (U-che-yen-na), Chi-ki-to, Mahesvarapura, Surātha, Atyanabakela (O-tin-p'o-chi-lo) und Langala (Lang-kie-lo). The last country is situated near the Great Sea towards the country of western women. If Mālavas were the people of Malava oder Malwa in Central India as is generally taken the countries named about are not placed in right order. Ujjayini which is the capital of Malwa is named after Surashtra und Gurjjara situated in Gujarat. Of all the countries in India, Ht. had a very high opinion of Mālava und Magadha. He says that people of these two countries had the reputation of loving the study of literature, of honouring virtue, of polite language und refined speech. In Mālava there were zwanzig tausend Mönche studying the teaching of the Sammitiya school of the small vehicle. We are told that going north-west from Langāla he went to Persia (Po-la-sse) which, lay outside India. Es wird gesagt, dass the bowl (patrā) of the Sakyamuni Buddha was in the royal palace of the country. On its frontier is die Stadt of Ormus (Ho-mo). The countries erwähnt next are Babylon? (Fo-lin), an island called the country of the Western women, which is tributary to Fo-lin, Langala, Pitasila (Pi-to-shi-lo), Avanda, Sindh (Sin-tu) Mūlasthānapura oder Multan (Mu-lo-s'an-po-la) und Parvati. If Avanda is to be identifiziert mit Avanti in Central India which seems probable in view of sein desçriptions of that country, it is difficult to place Avanda on the route followed from Langala to Multan. The country called Parvata was noted for renowned scholars. Ht. stayed there for two Jahre und studied the Mūlābhidharma-sastra, the Saddharma-samparigrahasāstra und the Prasiksāsatya-sāstra as preserved in the Sammitiya school. From Parvata he returned south-eastwardly to Magadha und from there to the Nālandā Monastery. There was in Nālandā a renowned Mönch called Prajñabhadra who was versed in the Three Pitakas, Sāstras etc. Ht. remained there for two Jahre und had sein doubts cleared through discussions. He spent two more Jahre studying several branches of study unter a renowned lay scholar named Jayasena. He is said to have been apprised of the time for sein return journey in a dream by Maitreya Bodhisattva. However, he was delayed due to unavoidable circumstances. In the meantime, Silabhadra, the master of sastras at Nālandā deputed Ht. to expound to the congregation there the Mahāyāna-samparigraha-sastra und to comment on the difficult points of the Vidyā-mātra-siddhi-sastra. About this time Simharasmi und Ht. held two different views about the principles of Yoga. Ht. proved more competent in the encounter und composed a sastra in drei tausend slokas resolving the controversy. This work was later approved for study. At this time further disputes took place zwischen the adherents of the two vehicles. Monks in Orissa belittled the Great Vehicle und were used to calling it "Sky Flowers". But der König of that country had a high regard for the Great Vehicle und challenged der Autority of the critics. Monks thereupon requested der König to hold a conference at which they would settle the issue. The controversy does not appear to have taken place at a conference as expected aber it came to an end mit the compilation of a book which was written by Ht. in refutation of the heretical views held by the Mönche of Orissa. The way he refuted heretical views made sein fame so widespread that König Kumārarāja of Karnasuvarna in Eastern India longed to have ihm as sein spiritual head in sein Königreich. When Ht. showed his reluctance for the third time der König turned furious und even went to the extent of threatening that he would destroy the whole of Nālandā Monastery in case sein request was turned down. Although at last Ht, complied mit the request of der König, Silāditya rāja's intervention enabled ihm to get out of another embarrassing situation. Silāditya rāja on sein part made arrangements to hold a conference for the exposition of the Great Vehicle und to refute the views of the followers of the Little Vehicle. Princes of eighteen countries were invited to participate in the conference. Renowned Buddhist Mönche, celebrated Brahmans, heretics, non-believers und secular persons attended the conference. For fünf Tage Ht. extolled the teachings of the Great Vehicle und no opponent had any opportunity to assert sein views. Adherents of the Little Vehicle learning that their school was shattered plotted to kill him. Der König, however, threatened to behead any one who made an attempt on the life of Ht. Es wird gesagt, dass, at the end, large multitudes forsook the Little Vehicle und embraced the Great-Vehicle. When the conference was over Ht. made up sein mind to go back to sein country. But on a request made to ihm by Silāditya to witness the quinquennial distribution called 'Mahā moksa parisad' he had to postpone for zehn Tage sein return journey. For sein return journey Ht. chose to follow the northern route in order to keep the pledge made von ihm to der König of Kan-chang that he would visit ihm on his way back. Getting out from die Stadt of Prayāga he took the route which lay across Kausambi, Jalandhara, Simhapura, Taksasilā und the river Indus. The boat laden mit ola manuscripts und Blume seeds capsized in the Indus und fifty manuscript copies und Blume seeds were lost. From there he went past Lamghan (Lan-po), Varna, Avakan, the snowy mountains, Kunduz (Hwoh), Tukhara, Kuran, Bolor und Kashgar up to Khotan. Of these countries Kashgar und Khotan were renowned centres of the Great Vehicle. Whilst in Khotan he states that he accomplished a journey of more than 50,000 li. His journey through various Königreichs took seventeen Jahre. Here he faced the problem of transporting sein books, images und such articles und sent a messenger to Kau-chang asking for help. Seven oder acht Monate later transport facilities were arranged. Among the books he brought were 224 sutras und 192 sāstras of the Great Vehicle; 15 works of the same categories belonging to the Sammitiya School; 22 books of the same belonging to the Mahisāsaka school; 67 books.... of the Sthaviravādin school; 17 works.... of the Kāsyapiya school; 42 works..... of the Dharmagupta school; 36 copies of the Hetuvidyā Sāstra; 13 copies of the Sabdavidyā sastra. Altogether there were 520 copies comprising 657 volumes carried upon zwanzig horses. Then he set upon the gigantic task of translating these books into Chinese. For carrying out this project he retired to the monastery of Hong-fu in Si-gan-fu. He completed the translation of 74 distinct works having 1335 chapters. He had moreover made a vast number of pictures und wrote mit sein own hands copies of various sutras. When all these works had been finished he closed his eyes und lay perfectly still. "Having recited some verses in adoration of Maitreya, he gradually sank until the day of sein demise on the 10th March, the 13th day of the year 664." (ix) prostrating oneself on the ground. Regarding the general education meant for Indians he describes that children in the beginning followed the 'Twelve Chapters' und at the age of sieben they began to study the great treatises of the 'Five Sciences'. Some idea of Buddhist education may be gained from sein description of Nālandā referred to earlier, But his estimation of the Brahmanic system of educating beginners is very high. Regarding the Brahmanic teachers he says: "These teachers explain the general meaning und teach them minutely, they rouse them to activity und skilfully win them over to progress, they instruct the inert und sharpen the dull. When Schüler intelligent und acute are addicted to idle shirking the teachers doggedly persevere repeating instruction until their training is finished....."
Ht. states that differences among various schools of Buddhism were seen in their tenets und auch in customs. According to Ht. different schools had their own tenets, und controversies ran high. As a result each of the eighteen schools claimed that each system was intellectually superior to others. Tenets of the Great und the Little systems differed widely. Certain concessions und gains were accorded to Mönche in keeping mit their knowledge und where the spiritual attainments were high the distinctions conferred were extraordinary. Referring to the drei Roben allowed for Mönche as their costume he narrates that different schools adhered to different styles having broad oder narrow fringes und small oder large folds. Ht. 's description about wearing sanghāti (seng-kio-ki) conforms to the present day practice of its wearing by Mönche in Sri Lanka und other Theravāda countries. As for the antaravāsa, (ni-po-so-na) the undergarment, he says that it was worn without a belt. Rather it was made into plaits und then secured by one of these plaits. Regarding social organisation Ht. informs us that society consists of vier caste groups. These vier castes form classes of various degrees of ceremonial purity. The members of a caste marry within the caste. Relatives whether by the father's oder Mutter's side do not intermarry und a woman never contracts a second marriage. Speaking about the character of the Indian people he tells us that they were of hasty und irresolute temperament aber of pure moral principles. They fear retribution for sins in future lives und take lightly their plight in the present life. They keep their sworn obligations. His account on law und punishment too, is interesting. According to ihm the offenders who violate statute law were imprisoned for life. For offences against social morality, disloyalty und unfilial conduct the punishment was mutilation or banishment of the offender out of the country oder into the wilderness. Other offences can be atoned for by paying a fine. He auch describes the vier ordeals by which the innocence oder guilt of an accused person is determined. For offences against the Vinaya, the community of brethren has a gradation of penalties. If the offence was slight a reprimand was ordered und the punishment wurde harsh according to the gravity of the offence. Expulsion from the community was the worst punishment meted out to the most serious offender. As for the disposal of the dead und the performance of the last rites, there were drei recognised customs. The first of these was cremation. The second was water burial, the corpse being put into a stream to float und dissolve. The third was burial in the wilderness, the body being cast away in the woods to be eaten up by wild animals. The Buddhist brethren were forbidden to wail aloud over a departed one. On the death of a parent they read a service of gratitude to secure for the deceased person bliss in the next life. If we are to depend on the records left by Ht. certain kings of the Gupta dynasty have patronised Buddhism. According to ihm Purugupta Vikrama Prakāsāditya, a Bruder von Skandagupta, Narasimhagupta Balāditya, Sohn und successor of Purugupta, Tathāgatarāja Vainyagupta, another Sohn von Purugupta und Vajira, a Sohn von Narasimhagupta Balāditya patronised Buddhism. All these kings contributed to the promotion of Buddhist learning by Gebäude monastic establishments at Nālandā. According to Ht. the worship of relics was widely praktizierten in viele Buddhist countries traversed von ihm und among these the most popular was the cult of the Tooth Relic of der Buddha. It was prevalent in Bhaktra; in an unnamed temple of a small valley situated to the east of the snowy mountain; Kashmir und Simbala. The next popular Buddhist cult was that of the Bowl-relic. Purusapura, the capital of Gandhāra as well as Persia are erwähnt as countries where the Bowl-relic was venerated. The following objects too were venerated: the sweeping brush made of kusa grass in Bhaktra, the skull-bone at Hidda (Kilo of Fa-hsien) in Nagarahara (Jelalabad), the eye ball, the sanghāti robe, und the staff at the same site und the garment washing stone obtained in Udyāna. A strong tradition about der Buddha presenting pieces of sein nails und some hair to two Kaufmanns who offered ihm honey und rice cake is recorded by Ht. mit regard to Bhaktra (The Life p.50). This is offensichtlich based on the account in the Vinays Mahāvagga where two Kaufmanns play a similar role at Bodh Gaya though no reference is made there to the presentation of nails to them. On sein way to India he passed through countries where Buddhism did not have adherents. Two such countries were Kan-chang und Sa-mo-kien. He succeeded in propagating Buddhism in those countries by delivering effective sermons. In the latter some devotees were so taken up mit the teachings that they even entered the Buddhist Order. It was partly due to sein evangelist endeavours that Buddhism which lay dormant after the age of the Guptas began to flourish during the reign of Harshavardhana.